Successfully Added Waterproof 30mW Green Laser Pointer (Commando Edition) to your Shopping Cart. 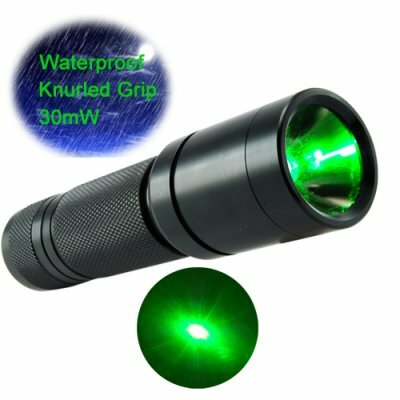 Powerful 30mW water proof green laser pointer in all-metal black casing with knurled grip. The commando laser pointer emits a laser beam can be projected to a distance of up to 500 meters and can be used up to 10 meters under water. Built to withstand the harshest weather environments, this military grade laser pointer can be used anywhere in the world from the Antarctic to the Savanna. This is a perfect gadget for cave exploration, paintball, urban warfare games, and marine biology. The CVJS-G84 also makes a great addition to any scuba diving kit. Enjoy diving in coral reefs while using this laser pointer to help your camera aim at the sea-life you want to capture on film. The Commando Series is available in stock now for single and bulk purchases. Get yours today at a low factory direct wholesale price from the leader in wholesale electronics, Chinavasion. Depending on weather and light conditions, the commando green laser can reach up to 500 meters. What is the distance that the laser beam can project up to under water? When using the commando green laser under water you will be able to see the beam. Depending on visibility, the laser can project 20 meters in distance.